These super easy to make delicacies are full of flavor, extremely tasty, and very hearty! Although the ingredients are few, the taste is surprisingly complex: a little sweet, a little tangy, a little savory. 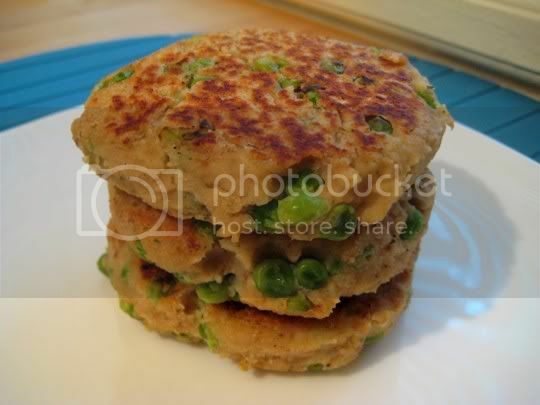 White beans, garlic, olive oil, and lemon juice (plus an egg and a little flour to hold the patties together) are pureed in a blender, then peas and seasoned bread crumbs are stirred in. Form a few burger-sized patties, and pan-sear for about 5 minutes on each side. I was truly amazed at how something so simple could be so wonderful. The patties have a hearty texture, with a crisp smoky outside. You might even try baking or broiling them for a firmer texture. The flavors of the garlic, olive oil, and lemon really come through, and the beans seem to emphasize all these flavors quite well. The peas add small juicy bursts of sweetness, and the bread crumbs add all the savory seasoning you need. These would be great as burgers, and served plain or with a marinara or cheese sauce on the side. Make again? Definitely. These could become a regular!